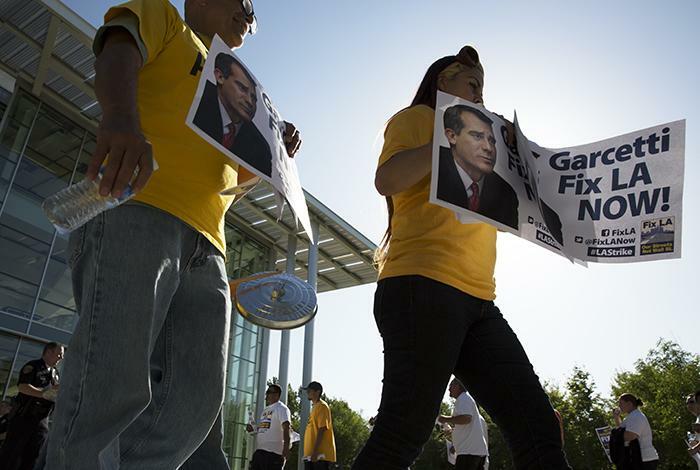 During LA Mayor Eric Garcetti’s delivery of the State of the City address, protestors marched outside CSUN’s Valley Performing Arts Center, demanding the mayor to make resolutions on working conditions and salaries for city workers on April 14. Twenty to 30 people marched outside the VPAC to promote their message of “Fix LA NOW,” as their signs said. The organization of the same name is protesting Mayor Garcetti’s current policies and believe now is the time to make some change in the city. “The way to rebuild the city is to protect and expand middle class jobs, rehiring 1000s of workers as a result of the recession, starting local hire and training programs, bringing the hiring back in house,” said Jono Schaffer, who is involved with Fix LA NOW. Schaffer also says the group is demanding that all LA city workers and contractors should make $15 an hour. “The services have been crushed in terms of tree trimming, trash removal, street cleaning, you name it. It’s a fraction of what it was,” said Schaffer. A Department of Transportation worker said “there has been nine months of negotiations” regarding truly “fixing” Los Angeles. Nobel Merritt has been working for the city for 10 years. Merritt stated the group’s mission is to make sure large banks are accountable to the citizens for the loans taken during the recession. She said citizens are still paying fees, which are our tax dollars. “Our tax dollars are going to Wall Street,” Merritt said. 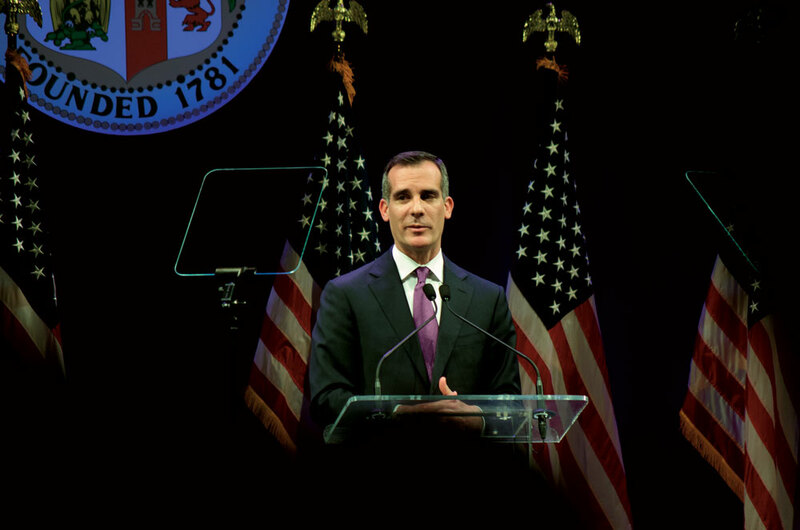 The protests are expected to continue while Mayor Garcetti continues to deliver his speech.